The Missouri Department of Elementary and Secondary Education is dealing with a $200 million shortfall in K-12 public transportation funding. The department is considering a proposed budget that asks for additional money over a nine-year period to fully fund the expenses, which is 75% of a district’s transportation costs. 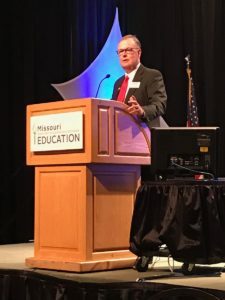 During a State Board of Education meeting in Jefferson City, Interim Commissioner Roger Dorson says the department used a similar approach to try close the gap in the underfunded formula used to finance Missouri’s K-12 public education. Board member Peter Herschend says he would like to achieve full transportation funding sooner rather than later. “That’s been a thorn under everybody’s side for a long, long time, the lack of funding on transportation,” says Herschend. The department’s current year school busing budget is $102.5 million. State funding for K-12 transportation has declined significantly over the years from 75% about 30 years ago to 17% in the current budget year, despite growing fuel and maintenance costs. While transportation funding has dwindled, some members of Missouri’s Legislature have celebrated their work to fully fund the foundation formula for the past two state budget years. During September’s board meeting, department budget officials are expected to submit funding priorities, including how much additional transportation money it wants.